Spending a ton of money on a sofa is worrisome. Spending a ton of money on a sofa you bought online and NEVER SAT ON is the stuff of nightmares. So, of course, that’s what we did. 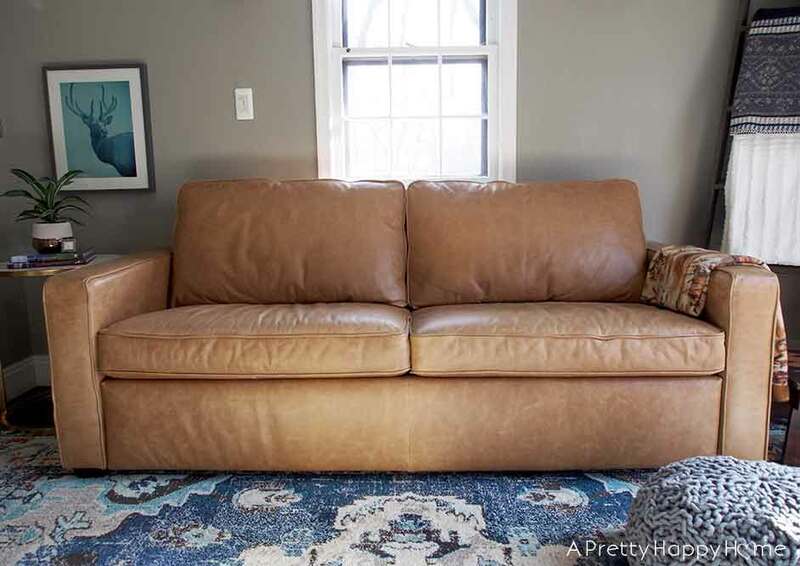 We purchased Amazon’s Rivet Andrews Leather Sofa in July 2018 and have lived with it long enough (over 6 months) to feel comfortable sharing our experience. This is not a sponsored post, but I do participate in the Amazon Associates program. If you use one of my affiliate links to make a purchase, I get credit but it doesn’t cost you anything extra. The Amazon Rivet Andrews Leather Sofa was not my first choice. 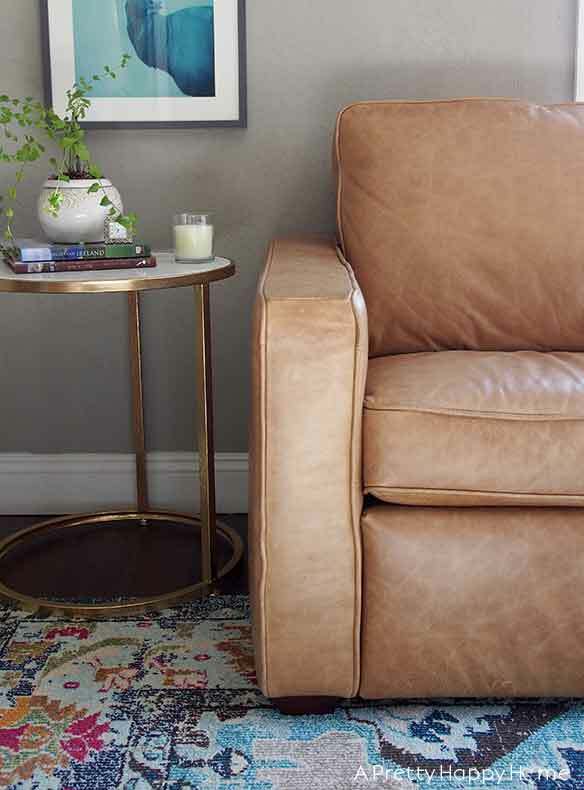 My first choice was a sofa from either Article (most similar in price and features), West Elm (more expensive) or Pottery Barn (more expensive). However, we had just made a costly international move back home to the United States and dropping thousands of dollars on a sofa was not in the budget. We also had zero soft surfaces to sit on besides our beds when we moved home, so waiting three months for a sofa to be built and delivered was also not ideal. That meant I needed to find a sofa that was not quite so budget-busting and able to be delivered relatively soon. It should be noted that many retailers carry versions of their sofas that can be delivered in 2 – 4 weeks. Amazon can deliver an in-stock sofa in about a week. I also spent a fair bit of time on Facebook Marketplace and Craigslist looking for a used sofa that didn’t look like it had been through an apocalypse. The planets didn’t align on that front, but Amazon Prime Day was coming up and I was hoping their sofas would go on sale. NOPE! Way to lure me in with your discounted blenders and then leave me hanging, Amazon. At this point we had been living without anywhere soft to sit for almost 2 months so I bit the bullet and purchased the Amazon sofa. You’d think I would have felt relief to have finally made a decision, but remember, this was my nightmare scenario. I just spent $1,299 on something I didn’t know if I would like. Yes, I know the sofa could be returned if I did not like it, but returning a sofa is a lot more complicated than returning a pair of shoes. Especially after I wrestle it out of the box. That was a hassle I was hoping to avoid. If you purchase a sofa from Amazon, you will select a day and block of time to receive your delivery. It goes without saying, you need to be home to accept the delivery. Our delivery person called me to say he was able to deliver my sofa earlier in the day, which worked out fine for me. Two guys unloaded the couch and put it in the room of my choice. They don’t unbox the sofa though. I was so excited to see what it looked like that I decided to try and get the sofa out of the box by myself. I’ll admit that was as tricky as it sounded and took me quite a few awkward maneuvers, but eventually I was able to unbox the sofa and remove the protective padding without breaking my back. Is the Rivet Andrews Leather Sofa comfortable? Yes. I’m sitting on it right now while writing this blog post. Have I sat on more comfortable couches? Yes. Definitely. I’ve sat on couches that you sink into and never want to leave. This is not that couch, but this isn’t an uncomfortable couch either. I’d say it starts out on the firm side, but I have noticed it ‘breaking in’ the longer we’ve had it, which is typical of a new couch. We purchased the 82-inch sofa, which is a little short for napping if you’re a tall person. Also, you’re going to need some pillows if you want to nap on this particular sofa because the arms are not rounded. The squared-off arms of the couch ARE great for setting a coaster and a drink. Or I can balance my phone or Kindle there and know it’s not going to fall off. I have not protected or conditioned the leather in any way, but I might in the future. We did have coffee and soda splash onto the couch a couple of times. We wiped it quickly with a damp cloth and it dried without stain or indication that the area had been wiped down. Now, if we were to not wipe up a spill or condensation from a glass right away, I know that would leave a mark – at least with the lighter cognac-colored leather. The thing that freaked me out the most about the couch was when my Husband sat on it with metal rivets on his jeans and made a mark on the leather. Not a raised scratch, but a distressed mark. The sofa’s leather already came with a slightly distressed, weathered look where it had some marks, but since I was hyper-sensitive to damaging our new sofa, these additional distressed marks caused me great angst. Now that I’ve gotten used to that, I’m okay with how it looks and it doesn’t seem to affect the integrity of the leather. I no longer can tell if we’ve gotten any new marks or not, but I have banned those jeans from the couch. The thing I compromised the most on with this sofa purchase is that the back cushions are not attached. It’s also one of the reasons why I went with this Amazon sofa over an Article sofa. A similar Article sofa with unattached back cushions was $500 more. Our sofa, as you can see, is placed against a wall so our kids can’t jump over the back of the sofa and mush the cushions down. They do wrestle and play on the sofa, but the back cushions have been surprisingly sturdy and the cushions don’t seem to slip down at all. This is probably due in part to the sofa being on the firm side to begin with and partly because we’ve been careful about how we use the sofa too. Also, one of the ways Amazon saves money on the construction of the sofa is that the cushions are not fully wrapped in leather. This doesn’t bother me since I’ve only looked at the back of the cushions twice. Once when I placed them on the sofa and once when I was writing this post just to confirm that I remembered correctly. I’d say it is a 50/50 split of leather to fabric on the backs of the cushions. 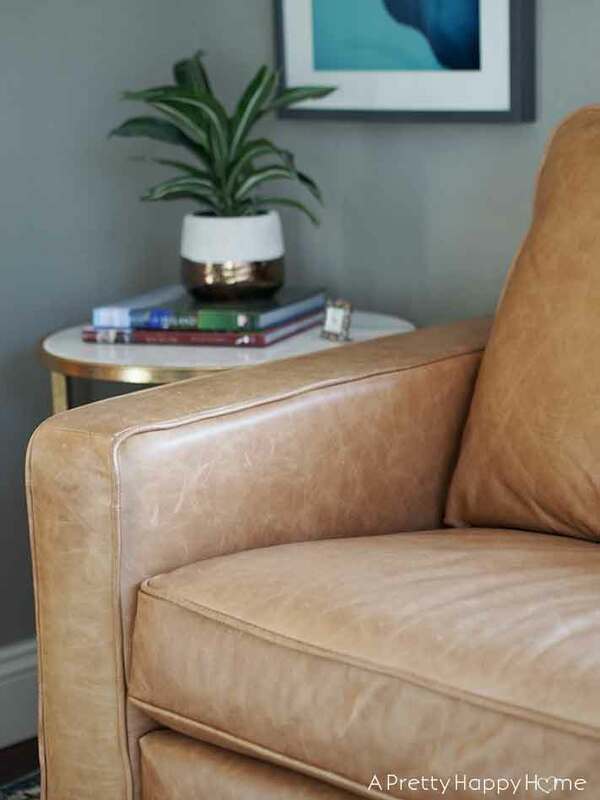 Would I Purchase the Amazon Rivet Leather Sofa Again? Knowing what I know now and given the same budget of under $1,500, I would purchase the sofa again. In terms of value for the money it looks almost like it did when we purchased it. I expect it to continue to function well as we haven’t had any issues with the stitching or integrity of the construction to date. And if you think about it, even if the sofa only ‘lasts’ 5 years, I paid a third of what a leather sofa would normally cost, so I still think I’m getting a great bang for the buck. In all reality, we will have this sofa much longer than 5 years. Also, and this is important, I don’t think you’d walk into my house and say “oh, that looks like a cheap sofa.” I don’t think you’d even wonder if it was an IKEA sofa. In person, the style and quality of Amazon’s Rivet furniture line make that a non-issue. Someday, if I had a larger budget for a sofa, I would purchase one that had attached cushions. That’s simply for my peace of mind. In my experience, couches with attached cushions stand the test of time much better. 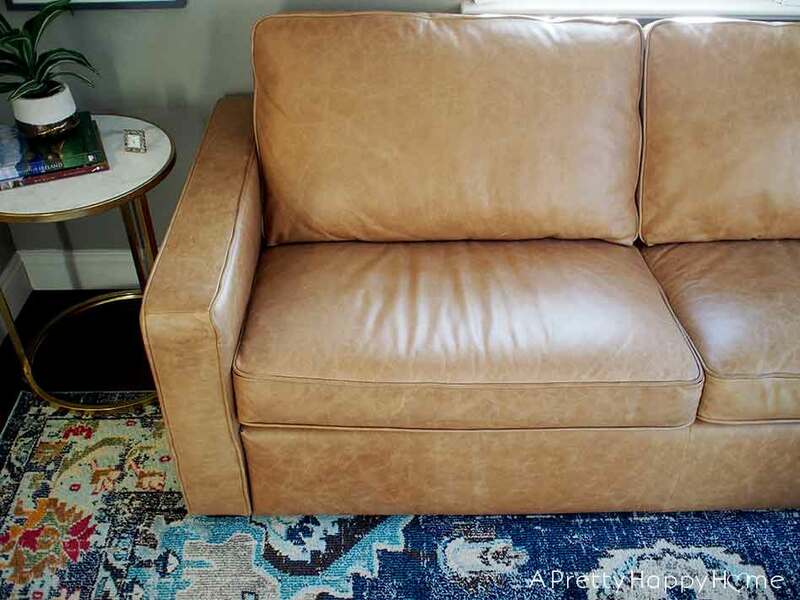 If I didn’t have to worry about accidental marks on the leather (and I’ve had a leather couch that was more durable in this regard) that would be a plus too. But then I didn’t pay $3,000 or $5,000 for this sofa either. I paid $1,299 and I’m happy and relieved with how this purchased turned out. Elk Artwork – Photo taken by me, available as a free download here. Frame from IKEA. *As I mentioned earlier, there are affiliate links in this post. I get credit if you make a purchase using one of my links, but it doesn’t cost you anything extra. It’s what helps keep this blog afloat, so thank you! Thank you for being here today! I really appreciate it. Here are some other posts you might enjoy.